¢	Tell us about you, your job role at BBC S&PP and what led your career in this direction? I received a BA in Media Production from Cumbria Institute of the Arts. In April of my final year at University, I applied for a Trainee Post Production Assistant role at the BBC and I joined In September 2004. I worked as a trainee for two years learning all aspects of Post Production. I undertook three different two week resident courses at the BBCs Wood Norton training academy. Over the coming years, I increased my knowledge of all aspects of post-production, working across multiple genres. I worked as an Avid assistant on largescale entertainment shows like Comic Relief, Children In Need, Strictly Come Dancing and Friday Download, amongst many others. During this time I also trained as both an EVS operator and Piero operator and worked on various sport programmes including Match of The Day, Grandstand and Football Focus. Working on various sports programmes gave me the opportunity to be a part of global sporting events including Euro 2008, Beijing Olympics, South Africa World Cup, London Olympics and most recently the Brazilian World Cup. In parallel to working on sport events, I spent a lot of time developing workflows and streamlining workflows for large scale Saturday night entertainment shows. In 2008, I became the Lead Assistant on Strictly Come Dancing and Strictly Come Dancing: It Takes Two. In 2014 I became the Post Production Supervisor for BBC Studios and Post Production (BBC S&PP). ¢	Describe in detail the Strictly Come Dancing workflow? Has the workflow changed since the last series? Due to the amount of rushes involved, BBC S&PP undertake all of the data wrangling, media management and content delivery from acquisition to transmission. Rushes are delivered to the data wrangler who quality checks, consistency checks and backs up to a 210 Terabyte Object Matrix storage system. On backup, Metadata is added to the footage. By adding this metadata, the rushes are stored in an organised way. TX Date -> Couple or VT -> Date -> Unique roll number. .
Once the rushes are backed up to the nearline, a team of loggers (along with the data wrangler) ingest the media at Native XDCam 50 resolution to the Cinegy logging system. The roll name created at the backup stage is copied onto the Cinegy system allowing ingests to be tracked. Once the rushes are ingested, the loggers start to log material. There are various tasks to be carried out. All of the interviews are clipped out and sent to the Avid, in addition the daily highlights are sent to the Avid as a story of the day sequence. If entire rolls of rushes are needed by the edit, then these are also sent to the Avid on a request basis. Its very useful to carry out Media Management at this stage, as a lot of the training footage isnt deemed to be interesting, so by only sending the highlights to the Avid has two benefits. Edit producers and editors have a concise amount of rushes to work with so the amount of Avid storage used is kept to a minimum. The loggers will then log the interviews with contestants word for word, which is beneficial to the edit producers. Once this is complete, the loggers will review training footage and log anything interesting that might have been missed by the team when they were filming. Each edit suite is equipped with a Cinegy logging station whereby the edit producers can review material, read or print logs, carry out simple compilation edits and send footage or simple edits in the Avid. The edit assistants work in conjunction with the loggers and data wranglers and they offer first line support. They also process all of the content sent from Cinegy and import it to the Avid. They export any footage needed for review via MediaSilo or exports for other broadcasters. ¢	On average, how many hours of footage do you handle per week? Across training material, specifically shot VT content, training run-throughs and studio content, we handle approx. 140-160 hours of material per week. .
¢	What does your typical day look like and how does this vary during show time on Saturday? My days vary, I work five days a week with my days off being Wednesday and Thursday (to allow me to work at weekends). I base myself with the team of edit assistants so that I can be across any questions that may arise and react to non-standard requests more quickly. At BBC S&PP, we have an open door policy for the edit assistants, meaning that clients request work to be done directly to avoid time delays. Most of my days are spent overseeing the edit and the staff working in the support areas (edit assistants, loggers and data wranglers). During the BBC One live show day I carry out a number of different tasks. I generally start a little later as the show doesnt finish until late in the evening. I record the voice over for the VTs first thing with the presenter. Once thats completed I watch all of the VTs ensuring that they are technically compliant for transmission and fix any technical hiccups. Ill then play out all of the VT content to the EVS operator in the studio, which is played directly from the Avid across a fibre connection to the studio. Once all of the content is delivered, we then prepare for the recording of the show. As there are over night edits cutting VTs, we live capture the show into Avid Symphony and also ingest interviews and behind the scenes footage from camera cards, which come from the studio throughout the day. Once the live show is finished, I arrange deliverables for various recipients. At that point I call it a night and leave the overnight edit assistants to support the two overnight edits and ingest the Results Show ready for editing first thing on a Sunday morning. ¢	What timeframes are you working to during the week and during the live show? Strictly Come Dancing relies heavily on the training schedules of the celebrities taking part in the series. The shows VTs go through a number of incarnations depending on how the weeks training is going. They get the final sign off on Friday evening and are finished on Saturday (the day of Transmission). 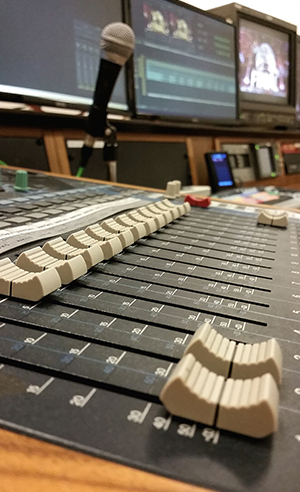 As all of the edit suites BBC S&PP provide are Avid Symphony suites, all of the edits are carried out in HD. Although there are cutting and finishing suites, all of the rooms are specd the same - meaning that more experienced editors can finish VTs as they go along. As everything is edited in HD, theres no need for lengthy conforms. ¢	What have you learnt about post working on such a high demand show like Strictly? Working on a high volume and fast turn-around show like Strictly has taught me the importance of reliability and resilience. Both for the people working on the show and the equipment we use. At the core of our edit facility is a 90TB Avid ISIS | 7000 which provides us with reliable and flexible storage. All of the equipment we use has resilience factored into it, from the Nearline and Cinegy storage to the assistants Avids and decks, to the edit suites. Any down time would have serious knock on effects to the output of the show, so reliability is key. ¢	How does the BBC S&PP workflow enable you to overcome these challenges? Our workflow has adopted various resilient systems in order to ensure that we havent put all of our eggs in one basket. We have multiple Nearline storage systems, we have invested in the most resilient and reliable Avid storage and we have a dedicated team of staff, from the data wranglers, through the edit assistants, right the way through to the engineering team. Over the years, we have built up strong relations with suppliers who can remedy issues at short notice, whether its delivering spare parts or offering technical support or the installation of full edit suites. We work with a core team of Freelance editors who have worked on the show for many years in some cases. Having the same freelance staff return each series means that new editors can learn the workflow from those whove done it before, allowing them to settle in quickly and get up to speed for the fast turnaround nature of the show. ¢	Are there any bespoke or key elements to the post workflow that youre most proud of and make the process easier? There are many small nuances to the workflow that add to it running smoothly, from the unique Dropspot XML for backing up rushes to the automatic upload of VT and training material to MediaSilo for review. Being based in a building with connectivity to both the main show and the SCD: It Take Two studios (spin off show) means that we can truly work in a fast turn-around environment, delivering content down to the wire. This means that the VT content can be more adventurous, for example, shooting behind the scenes VTs on the day of transmission. Also, working at HD resolution and in up-to-date and high specd edit suites means that the editors can confidently deliver material.